Sorry for the blurry photo, but this dorsal view better illustrates the yellow on the edges of abdominal segment 4. 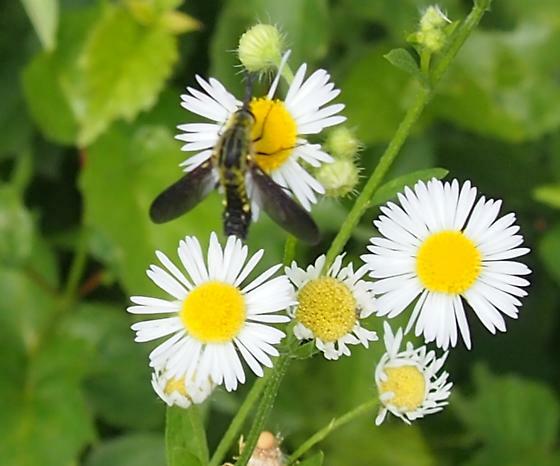 Feeding on Erigeron strigosus (known as prairie fleabane, daisy fleabane or rough fleabane). Habitat a dirt forest road edged with abundant flowering plants that passes through a high elevation boggy wetland dominated by leatherleaf, sedges, sphagnum and highbush blueberry. Adjacent forest mixed hemlock and deciduous northern hardwoods.